Ticket Alma Ata 1 - Arys 1 for train 23 (Alma Ata 1 - Atyrau) on 15th september 2005 at 14:14. Carriage 12 (platskartnyj), place 13. Ticket Arys 1 - Tashkent for train 382 (Ufa - Tashkent) on 16th september 2005 at 6:53. Carriage 2 (kupe), place indicated by conductor (mesto ukazyvaet provodnik) - well, that was the theory. In fact the conductor was quite surprised about boarding passengers at Arys and even more about European tourists. But I wanted to do Alma Ata - Tashkent by rail, and connecting from train 23 to train 382 was the only way to do it, alltough the 50 minutes connection in Arys seemed a little bit risky and also the woman at the travel agency in Alma-Ata, where I bought the ticket, warned me...but no problem, all trains were on-time. However, a free bed in my carriage on train 382 was not available alltough I had a ticket, so we were 5 people in the kupe. Ticket Atyrau - Tobol, bought at Atyrau. Departure on 2005-09-26 at 18:50 with train 691, place 33 in car no. 14 (kupe). I wanted to buy a ticket to Astana, but there wre no free places in that through car (the train itself only goes to Aktobe, where the through cars are attached to train 58 (Atyrau - Astana)). I could only buy a ticket up to Tobol in the through car Atyrau - Kustanaj (also attached to train 58, but detached at Tobol). Later, during a stop at Kandagach, I managed to buy a ticket Tobol - Astana, in a car Aktobe - Astana. 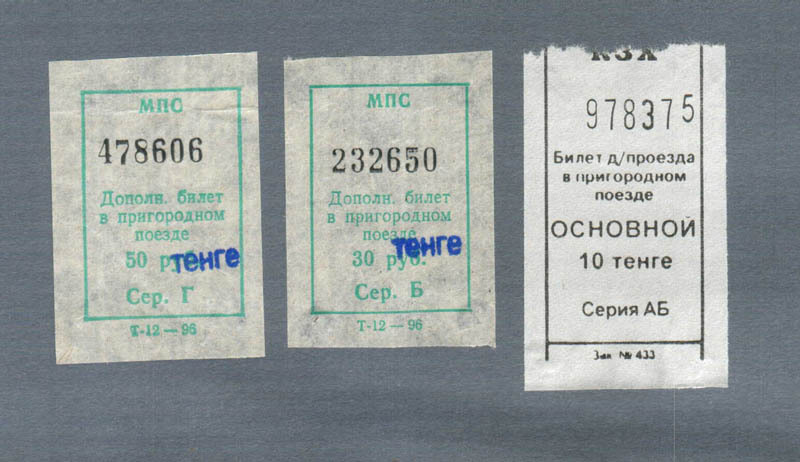 Ticket Tobol - Astana, bought at Kandagach during a 30 minute stop of train 58 (Aktobe - Astana). Departure at 5:24 on 28th september 2005, train 58, car no. 4, no place number indicated. There were no free places left in the through car Atyrau - Astana, so I had to change from one car to another at Tobol. Ticket Astana - Omsk. Initially I planned to continue my trip from Astana via Alma-Ata (using the Talgo train) to Novosibirsk and then to Irkutsk. During changing from one car to another in Tobol (about 30 minutes stop) in the early morning I wanted to buy my onward ticket from Astana to Alma-Ata for the same evening. But the Talgo was already fully booked. The woman at the ticket office suggested other trains to Alma-Ata, but as the Talgo would have been the only motivation for the detour via Alma-Ata, I decided to buy a ticket not to Alma-Ata, but to Omsk, which is exactly in the opposite direction. From there I would take a train to Irkutsk. I think I was the strangest passenger with which the woman at the ticket office had to deal ever... she was quite surprised about my changed plans just because no places in the Talgo train were available. The she said, that there was no train to Omsk from Astana, but as I knew, that there is a direct train today (it runs every other day and cvomes from Karaganda), I was able to convince her... kupe was sold out, so I booked platskartnyj. Departure on 28th september 2005 at 20:54 with train 345, car no. 3, place no. 42. The computer ticket for travel in EMU from Astana up to Karaganda, Kazakhstan, 19.09.2003. The railway ticket on a train 001 (Talgo-200) for travel from Alma-Ata up to Karaganda in the car with armchairs. August 2003. 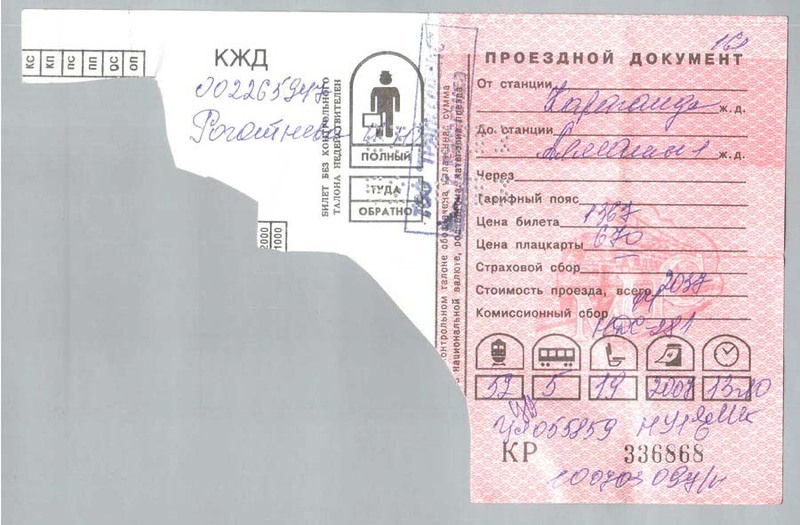 The railway ticket, written out manually on a train 052 for travel from Karaganda up to Alma-Ata in the compartment car of a speed train. July 2003. Рулонные билеты в карагандинских электричках продаются прямо в вагоне у кондукторов. Июль 2005. Казахстан. 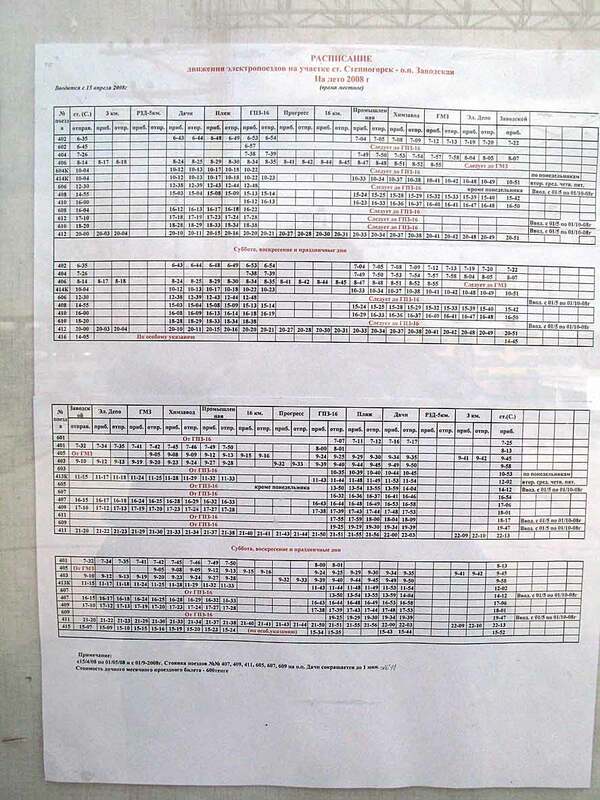 The rolled tickets in EMU in Karaganda are sold directly in cars at the conductors. July 2005. Kazakhstan.